Lowell W. Perry was nominated by President Gerald Ford to serve as commissioner of the U.S. Equal Employment Opportunity Commission on May 12, 1975. The Senate confirmed Mr. Perry on May 21, and he was sworn in as the sixth Chairman of the Commission on May 27, 1975. A life-long member of the NAACP, Mr. Perry, prior to joining the Commission, had served as plant manager of the Eldon Avenue Axle Plant of the Chrysler Corporation in Detroit. He was an all-American end at the University of Michigan, where he also distinguished himself as an honor student. Mr. Perry's professional football career ended in 1956 due to a serious injury while playing with the Pittsburgh Steelers. He subsequently served as an assistant coach scout for the Steelers while pursuing a law degree that he received from the Detroit College of Law in 1960. In 1960, Mr. Perry became a law clerk to Federal Judge Frank A. Picard of the U.S. Court for the Eastern District of Michigan. He joined the Chevrolet Division of General Motors in 1961 as a management representative for personnel activities in the gear and axle division. He served as a hearing officer and prosecuted unfair labor practice charges as an attorney with the Seventh Region of the NLRB from 1962 to 1963. 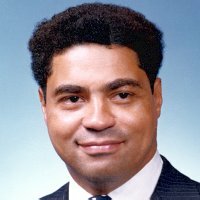 Perry received a law degree from the Detroit College of Law and is a member of the Michigan State Bar Association, as well as a lifetime member of the NAACP, and a member of the Urban League. He serves on the board of the NFL Board of Charities.